Nope! 2016/17 isn't over yet! Premier was just released and the Cup will be coming... probably much later (as always). Upper Deck always saves its big releases for the very end. 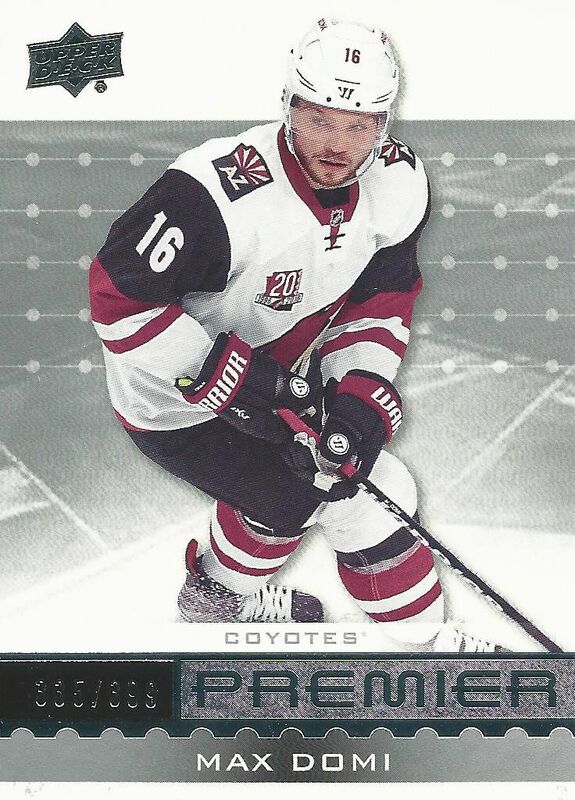 The last 16/17 release was the high-end Ultimate Collection set, but now we have Premier which is an even more premium and even pricier product than that. Each pack comes in its own metal embossed tin to make the breaking experience that much more exciting! The Premier base cards come on a thick card stock and are serial numbered to 399. The primary colors of the card are white, black, and grey highlighted by silver foil. Premier boasts a modern design, but nothing that really stands out or catches the eye. If anything, I'd say that the base cards are very safe. Nobody will complain about the way they look, but they are garner much excitement in the design department. As plain as the front design is, the backs are even more plain! Upper Deck really went with a no-nonsense look for this set. 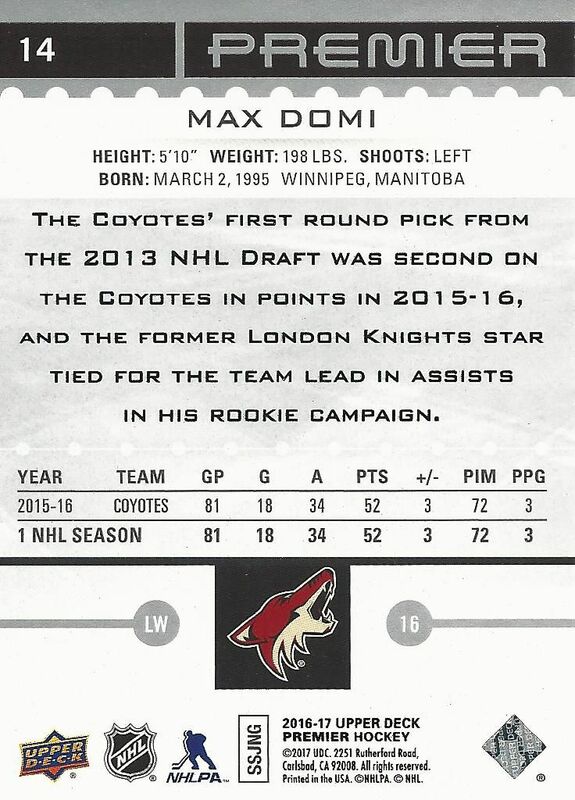 The backs have no pictures save for the team logo at the bottom of the card. There are also only one stat line for the player. Thankfully, the cards have a nice write-up to read. Often times I prefer this to complete stats as I find the information more interesting. 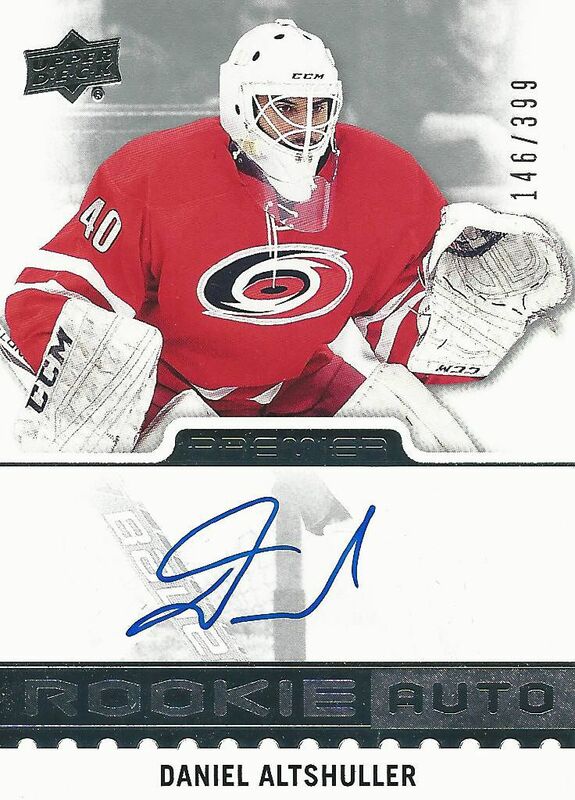 Some of the rookie cards in the main Premier set feature an autograph. The autographs are on-card and numbered to 399. In terms of design, these cards follow the cue of the base cards in that there is not much fanfare on the card. The most outstanding design element of the card is the foil 'Rookie Auto' section below the signature. Most of the rookies in this rookie subset tend to be second tier rookies that don't have much hobby significance. The Rookie Auto Patch set is where most of the key rookies reside. These cards stand out with their slick acetate front, large patch, and on-card autograph. Though the design is very much on-par with the rest of the set, these cards look much better because of the patch area. A nice patch could really make one of these cards stand out in a big way. There are two tiers of rarity within these cards. Most of them are numbered to 299 while the top of the class rookies are numbered to just 199. Being a high-end product, collectors expect the best when purchasing a tin of Premier. Each box comes with just one big fat pack of cards. In that pack are autographs and premium materials. At nearly $300 USD at the time of release, there better be some good stuff to find! The Premier Rookie insert looks like it came out of the base set, but these cards are indeed an insert set of its own. Like their main set counterparts, these cards are either serial numbered to 199 or 299 depending on the player. These cards aren't too exciting, they are really just another way Upper Deck could put in more rookie content for the set. I don't see these cards as being too popular or sought after. 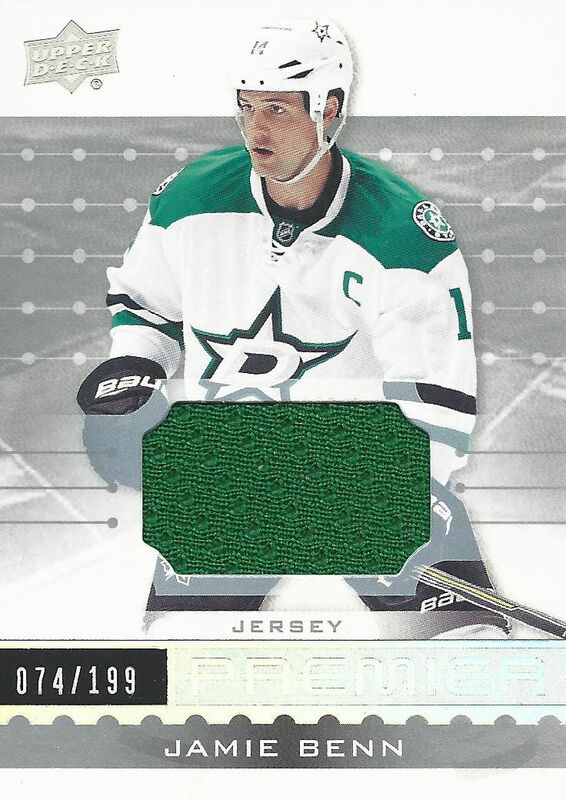 This Jamie Benn jersey card is a jersey parallel of the main set. These cards are direct parallel cards with material embedded in them. These cards have a medium sized amount of jersey and are numbered to 199. Some of the retired players in the set have been short printed. Very rare neckline and tag variations of these cards also exist. Those cards are numbered to /6 and 3/ respectively. The Premier Swatch insert set is another way to get jersey swatches out of Premier. These cards utilize a horizontal design and have varied numbering depending on the player. I prefer these cards to the base jersey parallels because this set has a design that is a bit more eye-catching. Patch variations of these cards also exist. 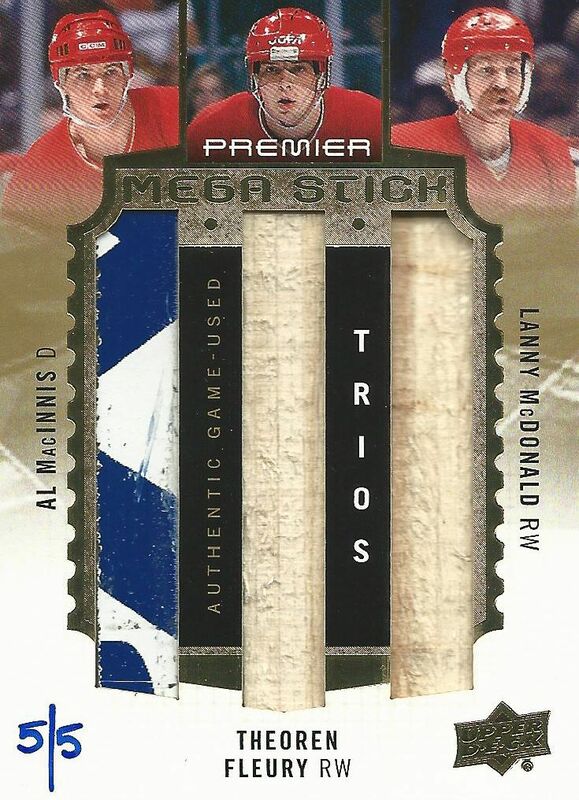 The best card out of my tin of Premier was this Premier Mega Stick triple relic hand-numbered to just 5 of Al MacInnis, Theoren Fleury, and Lanny McDonald. It's a pretty awesome card in that the game-used material takes up a good majority of the real estate. I also like the hand-numbering aspect of this card. Pieces like this are what collectors look for out of products like Premier. Though I'm not a Flames fan, I do appreciate this card very much! Premier is chock full of amazing content. Getting that content can be pretty difficult. Each tin of premier should have something nice in it, but the case hits are what collectors will be keeping an eye out for. For those looking for the top rookies, there are a few rookie retro insert sets that will definitely be hot items. Last year I was lucky enough to pull a Connor McDavid retro rookie. Similar cards are again in this year's release that I'm sure will be much desired. Upper Deck Premier is a really interesting product. As a high-end offering, there is a lot to love about it - especially the rookie content. 16/17 had a very good crop of rookies, so getting any autographs from them would be a nice score. That being said, many of these rookie autographs have a higher serial numbering than those found in Ultimate Collection or The Cup. It makes me wonder how the long term values of these cards will do in comparison to its high-end brothers. They will definitely have good value, but will they stand side-by-side with those cards or be a notch down? We'll just have to to see. The large memorabilia insert cards like the triple stick in my tin are great finds in Premier. These cards have high interest and look amazing in-hand. I was very happy to find my Mega Stick hit and I'm sure collectors who find similar cards will be equally as happy. As with all high-end products, Premier is a risky venture. With its very high price tag, not all collectors will be able to enjoy a tin of it. 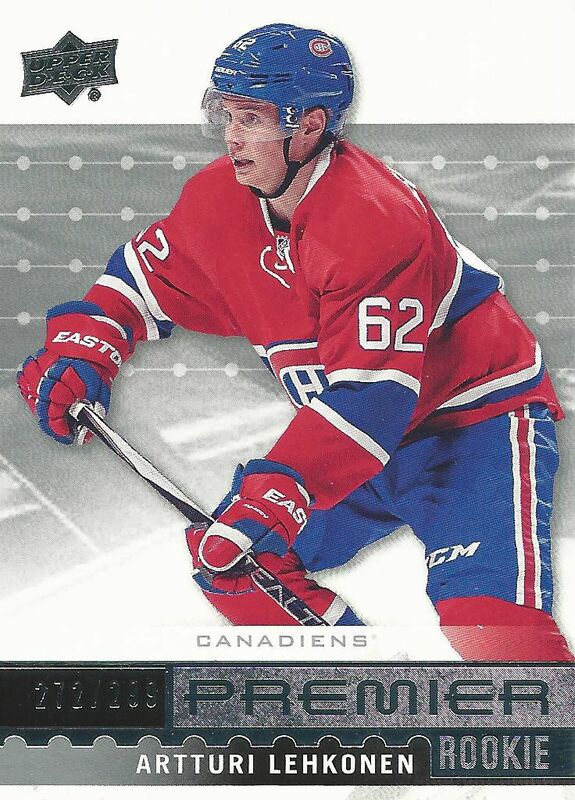 While Premier is a very good product, its place in Upper Deck's high-end line up may not justify its cost. I guess if it were up to me, I would get a couple boxes of Ultimate Collection or just wait for The Cup. 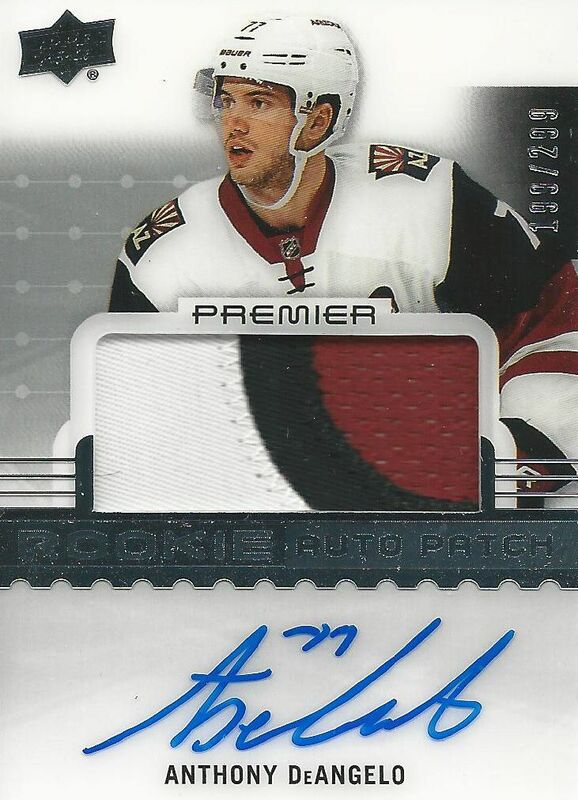 If high-end is your thing though, Premier is a great hold over until Upper Deck's biggest release. Love the look of Premier as always! Just a little too expensive for me. Great Break love that deangelo rpa. Looks great and the flames card looks sick, but a little out of my price range. That triple stick card looks amazing. I love the base card design. The cards look really good and that triple stick card is very sweet! Nice product fun too watch others break as it is out of my price range they should have more packs and cards in the box would add more entertainment n value too the customer nice triple stick card!! Nice hit. I love flames so that is a really nice looking card. Super sick triple stick and A nice rpa and oK base design but overall its A great product! Wow!!! That was an amazing box, and that triple stick card was very nice! Good looking cards this year. Great hit for the Flames! Good review as well. Risky gamble! Premier looks amazing, that stick card is really sick aswell. If it were under 300 I would buy it but unfourtanetly it isn't. Love the look of Premier this year. That stick card is beautiful! Definitely the best year of premier thus far! Pretty pricy though. Im sure it was expensive... but it looks awesome! Great quality hits and sweet base look. Upper deck Premier is expensive box, but I think that the cards are looking good this year. Very interesting break as always. Wow! Not a Flames fan per se, but man, what a pull with the GU stick trio! Overall, a very solid break, and thanks for sharing as usual, Luke! Really like the Flames stick card! For one of Upper Deck's highest end products, they didn't dissapoint at all this year. The quality of this year's Premier was on the same level if not better than last year's Premier, and last year's Premier was decent as well. Expensive hit or miss product. I will pass on this one but you got a nice Flames Card. The auto-acetate card looked really nice as well! Nice break! Great break. The prodcut looks more loaded compared to other years. Nice video. Flames triple stick is really awesome. YT: Dzmitry 93. Love that Flames card! Nice break! Nice cards. As usual, great review! Awsome review luke!! I am in love with the triple stick!!! I feel it is awsome product to buy if ur lokking any hits in paticular. I still dont have a single, im dying for one!!! Sick flames card, but the box is too expensive! 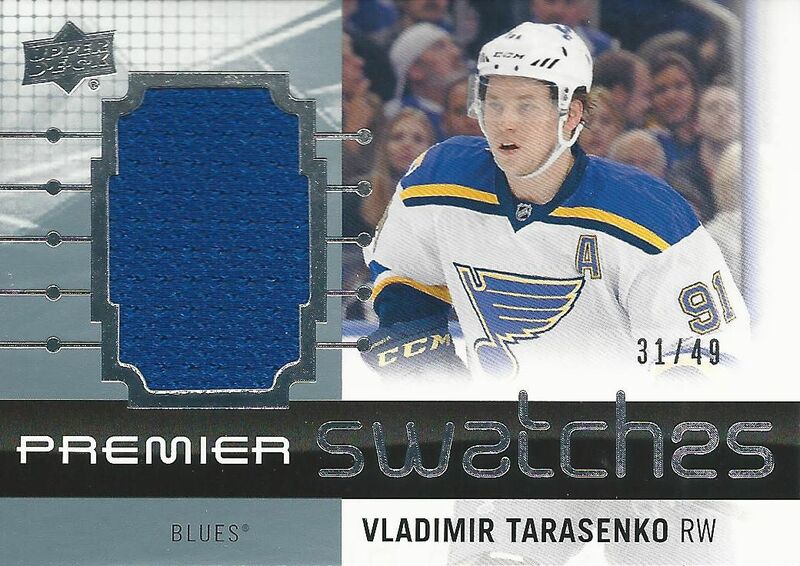 The stick card has been one of the best cards I've seen pulled out of Premier so far. Great review as always! Not enough bang for your buck. Fail UD. Great-looking cards in an ugly tin. Nice stick card. You can pull some monster cards out of this and luckily you pulled one !! Well done buddy !! Woah, very nice break, nice product & fair review! Nice high-end product. Nice review BTW. Really nice looking cards in my opinion but for the high price I was hoping for less base cards. I don't feel like you get your money's worth with premier but definitely another great review!! Very nice hits! Liked the review. the base cards are nice and the DeAngelo card in on point. But because I am a flames fan the mega stick if definitly the best card of the break by far.